National Federation of Music Clubs 2014-2016 Selection Piano Solo. 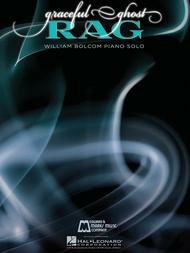 Composed by William Bolcom. Piano Solo. Ragtime. Single. 5 pages. Edward B. Marks Music #MS86. Published by Edward B. Marks Music (HL.9437). 9x12 inches. Key: Bb minor. , slightly neo-tonal, but never really dissonant to the point of repelling a person whose musical preferences are firmly anchored within a traditional tonal system. This piece may not be for a beginner but if one has sufficient technical facilities to handle it the musical reward will be immense. Strongly recommended. Most appealing piece I’ve heard in along time. Greatly enjoying learning it. The harmonies are divine as well as the rhythm. Received very quickly. Music is clear and easy to follow.
. It's a beautiful, intimate rag with a lot of challenging stuff. The rag can be played in straight time or swing. I would rate this harder than a Level 8. I've seen it rated by RCM as a Level 10. This is definitely advanced, but sounds great once it is played well. It's quite a satisfaction to get through this piece.